Treasury Proposes Plan To Purge 'Toxic Assets' The department offers a private-public partnership proposal to buy up the troubled assets — with the government taking a large portion of the financial risks. 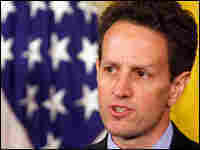 Treasury Secretary Timothy Geithner, seen March 16, unveiled details of the latest financial rescue plan on Monday. Step 1: A bank has a pool of residential mortgages with $100 million face value that it's seeking to divest. The bank would approach the Federal Deposit Insurance Corp. Step 2: After conducting an analysis, the FDIC would determine that it would be willing to leverage the pool at a 6-to-1 debt-to-equity ratio. Step 3: The pool would then be auctioned by the FDIC, with several private sector bidders submitting bids. The highest private bid — in this example, $84 million — would be the winner and would form a Public-Private Investment Fund to purchase the pool of mortgages. Step 4: Of this $84 million purchase price, the FDIC would provide guarantees for $72 million of financing, leaving $12 million of equity. Step 5: The Treasury would then provide half of the equity funding, or $6 million, and the private investor would contribute $6 million. The Obama administration on Monday launched its latest initiative to stabilize global credit markets, with Treasury Secretary Timothy Geithner pleading for patience regarding a partnership between government and private investors that could absorb $1 trillion in banks' toxic assets and jump-start new lending. The centerpiece of the proposal, according to a fact sheet released by the administration, is a plan to expand the new Term Asset-Backed Securities Loan Facility, or TALF, to start the Public-Private Investment Program for Legacy Assets — a partnership to acquire the bad loans. TALF would buy the loans from banks and then bundle them into privately administered investment funds that would be partially guaranteed by the Federal Deposit Insurance Corp. The latest effort to jump-start the economy follows a week in which lawmakers tapped a populist nerve, with the House voting to slap a surtax on bonus payments made to employees by American International Group and other companies receiving federal bailout money. Under the plan, the $200 billion that currently funds TALF would be increased to $1 trillion. The money would be used to purchase older residential mortgage-backed securities that were once highly rated, as well as commercial mortgage-backed securities and asset-backed securities that are highly rated, as loan collateral. The White House says investors as well as taxpayers stand to profit if they get a bargain. But if the investors overpay, they could lose much of their investment and taxpayers would be on the hook for a lot more. The Treasury Department would initially hire five or more investment managers from pension funds, insurance companies and hedge funds that can demonstrate an ability to raise private funds to buy securities. Treasury will provide up to 50 percent of the equity capital that the funds will need to get started. As an example, the fact sheet said a batch of mortgages would be awarded to the highest bidder, with the FDIC providing a debt-financing guarantee for 88 percent of the total investment, leaving 12 percent in equity to be split between Treasury and the private investor. 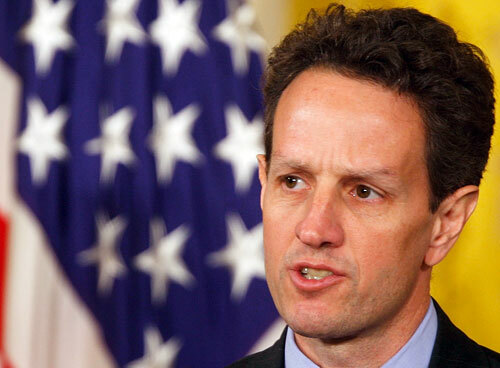 Geithner, who has endured calls for his resignation over his handling of the crisis in recent days, held a session with reporters in which he acknowledged the public's "deep anger and outrage" over the banking mess. He said the plan will seek to take a half-trillion dollars in bad assets off banks' balance sheets, a figure he said could eventually grow to $1 trillion. Geithner said that in general, investors who take part in the program would not be held to any government-imposed salary limits. While Congress is cracking down on big Wall Street bonuses, Geithner says investors need to be confident the rules won't change. Wall Street opened sharply higher on Monday after the plan was unveiled, following world markets that soared ahead of the announcement, the details of which were leaked over the weekend. Shares in Citigroup — likely to be a major beneficiary — surged. But critics such as Nobel Prize-winning economist Paul Krugman were skeptical of the plan. Krugman, writing Saturday in The New York Times, said the proposal would do little to prop up the banks at biggest risk. "This plan will produce big gains for banks that didn't actually need any help; it will, however, do little to reassure the public about banks that are seriously undercapitalized," he wrote. "I fear that when the plan fails, as it almost surely will, the administration will have shot its bolt: it won't be able to come back to Congress for a plan that might actually work." President Obama said Monday that he is confident that taxpayers will "share in the upside as well as the downside" of the financial crisis, adding that the plan is just one element and that Americans "still have a long way to go."